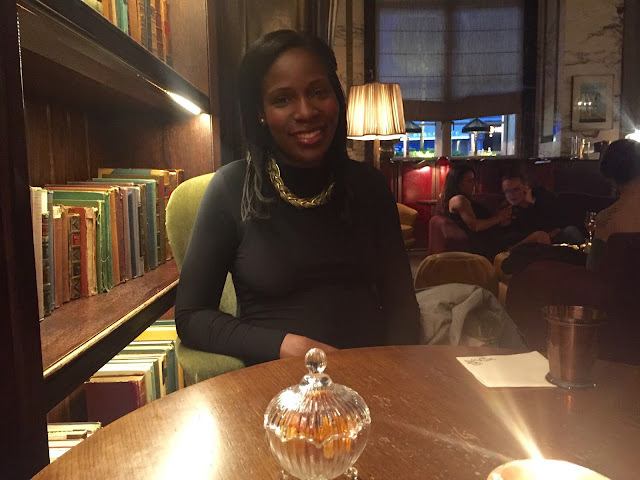 This weekend my husband and I stayed at The Rosewood Hotel in Holborn, London for our baby moon. For those of you haven't heard of a baby moon, this is a pampering break away for couples before the baby arrives. While many people use their baby moon as a excuse to lie on a beach soaking up the sun or stay at a quaint country manor we wanted something a little different. Living and working in London we don't always have a chance to enjoy the capital like a tourist would, which is why we thought a babymoon in our vibrant city would be ideal way to spend some quality time together before the baby arrives. Best of all, we chose the bank holiday weekend so it would be less busy as more people escape the city at this time of year. I knew there was only one place I wanted to stay - The Rosewood Hotel, one of London’s most luxurious hotels. 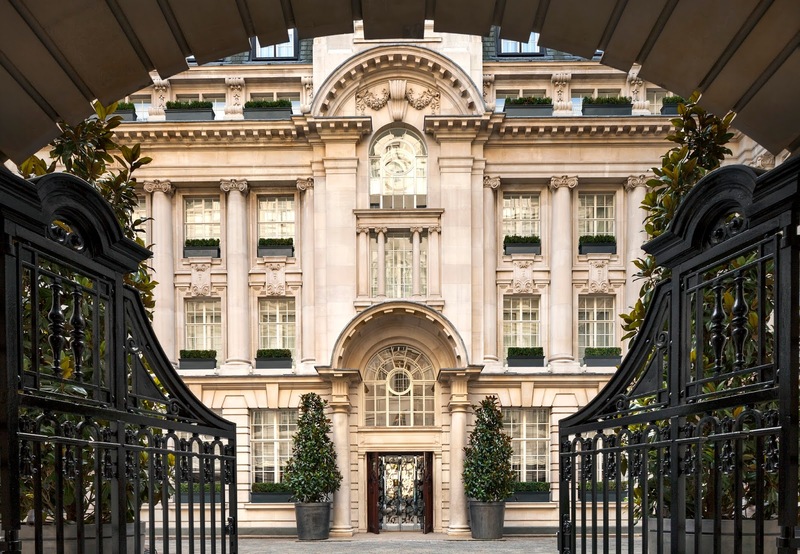 In the heart of Holborn, The Rosewood was perfect base for our babymoon. Located within a few minutes from Holborn tube it is minutes away from Covent Garden so perfect for a spot of shopping or a day at the theatre too. 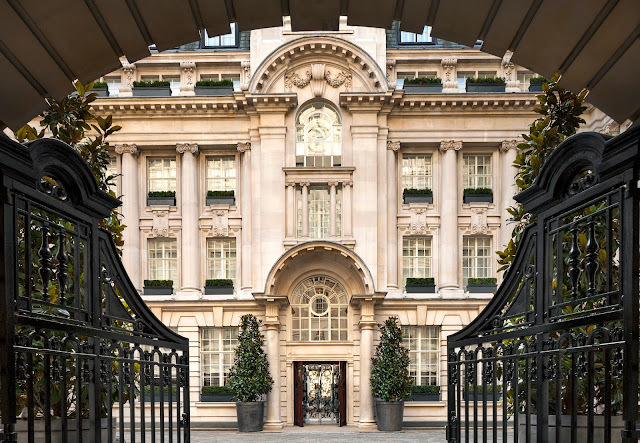 From the moment you arrive at the large wrought-iron gates of grade II listed Edwardian building, you are in awe of the beautiful architecture of the hotel. As we walked through the tranquil courtyard and into the hotel lobby we were taken away with how opulent the building was. The five star hotel is luxury at its best: the lobby is rich in every detail, decorated with such style and sophistication it feels like a mini palace! All around you is an elegantly decorated building: the beautifully designed black and white marble mosaic flooring, the stunningly high glass partitions filled with art and books, the magnificent marble staircase, and even the cute bulldog statue and birdcage full of budgies placed by the lift doors. This is a beautifully decorated hotel and feels very lavish. The reception staff, who were incredibly welcoming and helpful, checked us in and then shortly afterwards we were shown to our room where we were impressed further once we entered the elegant suite. We stayed in deluxe junior suite: spacious and super sleek one bedroom and one living room elegantly designed with a contemporary look and feel with light grey and cream fabrics, textured dark woods and plenty of space to relax. Every detail of the suite was well thought out and designed with style. 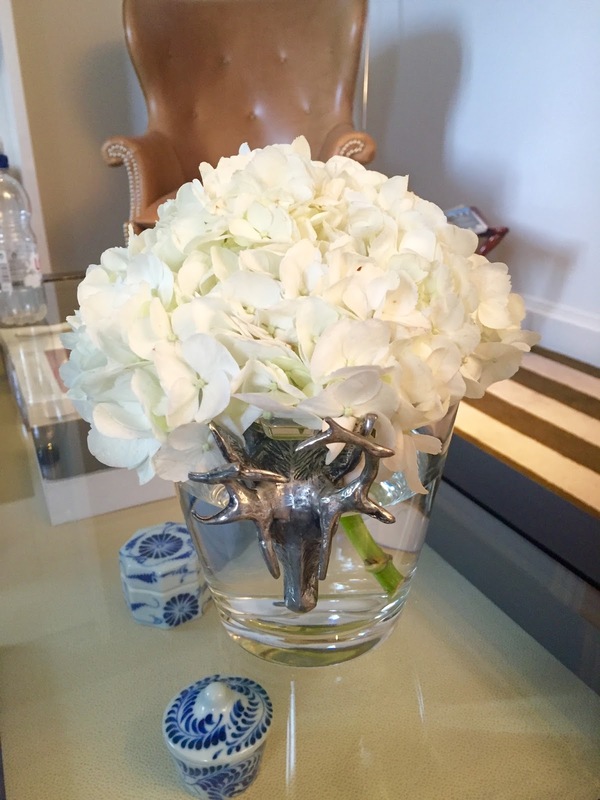 There were beautiful fresh flowers placed in the living area creating a homely but contemporary feel to the room. 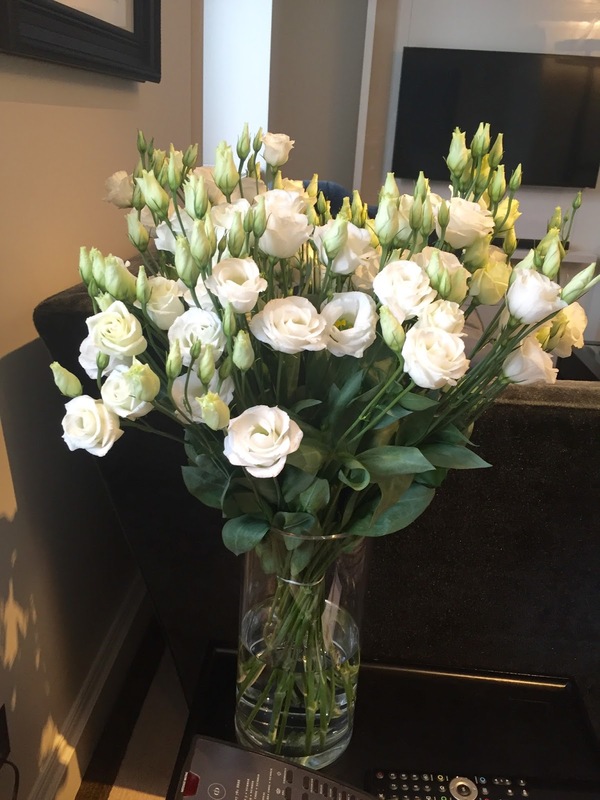 Always a treat waking up to beautiful flowers! The suite featured a large bedroom with a spacious ensuite marble bathroom that had a walk in wet room style shower and a bath. But it was the little touches that made the big difference like the king size bed dressed with elegant Rivolta Carmignani Italian linens, the bathroom stocked with Czech & Speake toiletries, personal bar with complimentary snacks and non-alcoholic beverages or the smart Nespresso coffee machine. But best of all was the pregnancy pillow left on a chair for me. If you read my last post on how pregnancy pillows have eased my discomfort then you'll realise how much I have appreciated seeing a pregnancy pillow in the suite! The staff at The Rosewood also kindly gifted me with a basket of baby goodies, by Bamford Organic, luxury baby products that are natural, fresh and smell divine. It's these little touches that make a big difference and why The Rosewood really does deliver on its luxury and 5 star status. We then headed to the Sense Spa which has seven treatment rooms designed around a circular gold leaf and teak relaxation lounge. Men and women have their own dry heat saunas and amethyst crystal steam rooms and offers facials, treatments and beauty rituals. For pregnant women there is a choice of treatments such as the post and pre natal massages. Being in my last trimester, I chose the pre natal massage, that focused on aching muscles, fluid retention and tired feet and legs, a perfectly designed spa treatment to comfort and relax mothers to be. After our relaxing treatments we spent a few hours in our suite before getting ready for our dinner reservation. I had always wanted to experience The Rosewood hotel's restaurants and bar. There are three dining areas at the hotel: the Mirror Room, the Lobby or Holborn Dining Room, which is where we selected as the place for dinner that evening. 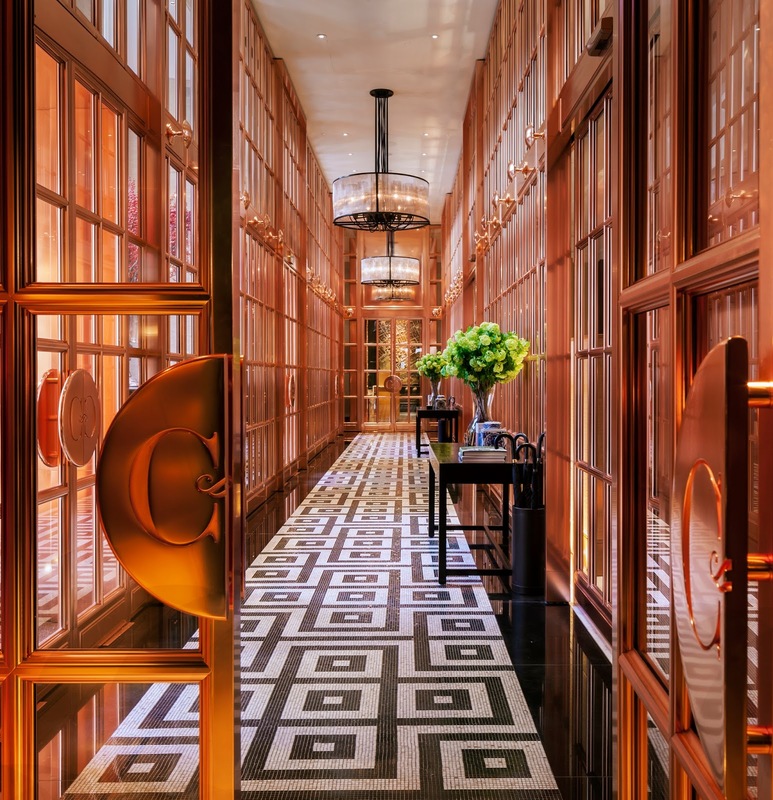 The restaurant is just as lavish as the hotel, decorated with oak furnishings, red leather upholstery and antique mirrors, diners can expect a varied menu of British dishes with a twist and London's largest gin bar with over 400 gins and 27 tonics. Whilst my husband opted for a Cornish gin and tonic called the "Tarquin", I chose the fresh cranberry juice with rosemary, lime and soda water mocktail. To start, I had the tasty fried squid with relish mayonnaise and he chose the griddled prawns with lemon and garlic butter. For mains he had the roast rib eye club cut and I chose the shrimp burger with jalapeno tartare - delicious! To finish off our tasty meals, we had the apple pie with ice cream to share. After dinner we headed to the Scarfes Bar for the jazz night. It was like stepping back in time to an old school drawing room, the bar is cosy and intimate, decorated with velvet armchairs and sofas and bookcases filled with antique books. We were serenaded with the beautiful sounds of jazz tunes with a live performance from a singer and band - the perfect way to end a great night. The Rosewood is luxury at its best and the perfect setting for a special occasion like a babymoon. If you are looking for ultimate indulgence and a retreat in the city then this is the place for you. The hotel is a beautiful oasis of tranquillity away from the hustle and bustle of the city that is unique among London luxury hotels. We had such a memorable stay, it was the ideal way for us to spend our baby moon and we will no doubt be returning again! To book a stay at the hotel visit www.rosewoodhotels.com.